Precious Jones (Gabourey Sidibe) is 16, illiterate, and pregnant for the second time by her own father. To make matters worse, she is abused physically and verbally by her mother (Mo’nique). Precious’ life seemed totally hopeless until she had an opportunity to go to alternative school. 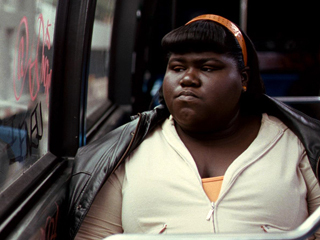 Precious: Based on the Novel “Push” by Sapphire was nominated for something on the order of 6 Academy Awards in 2010. I finally saw it now after having avoided seeing the movie due to having seen the trailers; I feared I would see the movie and come out with post-traumatic stress disorder considering the intensity of the visuals I saw in the trailers. Fortunately, the movie actually turned out to be much easier to watch than I thought. The movie began with some pretty serious pacing issues. The first half of the movie, which largely involved Mo’nique abusing Sidibe and generally illustrating what a rough life the latter was having, was just moving very painfully slowly. Mo’nique’s character, who sat in front of the television all day waiting for welfare checks, reminded me of the movie itself. Interspersed throughout were ridiculous (politically incorrect?) fantasies (i.e. being a slim, blonde white woman) that Precious had. Thankfully, things improved around the halfway point when Sidibe started taking classes with Blu Rain (a strikingly beautiful Paula Patton). The story just got a lot more interesting at that point, when it seemed like Precious wasn’t at a dead end in life anymore. Overall the acting was good. I though Mo’nique was entirely believable as Precious’ abusive mother as was Sidibe as the title character. The problem lay entirely with Lee Daniels’ directorial style. The movie had its moments of brilliance with cinematography, but I thought Daniels was trying too hard most of the time. From intentionally misspelling the opening credits to cutting out frames of Precious walking across a hallway to the room where Precious sees projections of things like Martin Luther King Jr. giving a speech. Lee Daniels almost reminded me of the Pate brothers in their direction of the decidedly mediocre Deceiver. The worst scene is when Precious was getting rushed to the hospital to deliver her second baby. She was under the care of Nurse John (Lenny Kravitz). The problem with that scene was that I actually thought it was another one of Precious’ fantasies at first until I saw the fantasy didn’t appear to end, and that was largely because of how Kravitz acted that scene. This also brings me to how I also thought that the movie tried a little too hard to have random famous people in the movie. Mariah Carey (a singer, not an actress) actually did a good job as a social worker, despite having a pretty minimal on-screen presence, however I thought the movie pushed it by bringing Kravitz (another singer) in. Ultimately, did I hate this movie? No. (Ok, fine. Yes I did.) Did I feel the movie deserved all the Oscar nominations (and 2 wins) it got? Definitely not. Precious more or less reminded me of a humorless Gridlock’d, only I think the PR people did a much better job. Gridlock’d wasn’t a great movie either, but it was a much more lighthearted look at poverty-stricken areas in America and consequently easier to watch. The thing is I’ve seen other movies about the plight of minorities (like Gran Torino) that I thought were absolutely fantastic. Still, somehow Gran Torino was almost totally ignored by the Academy the year it came out but somehow Precious was nominated for Oscars in something like 6 categories. I totally disagree with Lee Daniels being nominated for Best Director since many stylistic decisions he made just wound up looking stupid. I totally disagree that Precious deserved to be nominated for Best Picture, but then again, it lost to The Hurt Locker of all things. Finally, yes I concede Mo’nique’s acting was good, but I don’t think she deserved the female version of the same award that Heath Ledger won for his portrayal of the Joker; their acting was definitely not on the same tier. I just need to mention that I revised the score to be a 2/4 instead of a 2.5. I thought about it, and realized a 2.5 means I liked this movie almost as much as I liked GoldenEye or North by Northwest, both of which were FAR superior films. Precious was a movie I had a hard time scoring in that I found I didn’t hate the move quite as much as I thought I would, but it still wasn’t what I defined to be good. I haven’t seen it, but it’s one that’s been on my Netflix queue for awhile. I too, am putting it off. My personal opinion: If you have anything better to watch (I mean even something like a James Bond movie, even Moonraker), then continue putting it off. Precious was definitely nowhere near as wonderful as the Academy appeared to think it was in 2010, but then again that was the year The Hurt Locker won Best Picture.